A blind war veteran from Stockport is appealing for the return of his Second World War medals lost at a motorway service station. Blind D-Day veteran Alfred Barlow (right), 96, who lost his medals at a motorway service station Credit: Press Association. A 96-year-old war veteran says he's overwhelmed by the way the public have responded after his military medals disappeared at a motorway service station. Alfred Barlow, who is blind, fought on the beaches of Normandy 70-years-ago. He tearfully appealed for help to find them, and the actor Hugh Grant even offered a reward. Today Mr Barlow was presented with a replacement set of medals - medals he says he will be happy to hand them down to his grandson. Our correspondent Rob Smith reports. A blind Second World War veteran says he has been "overwhelmed" by the public response to track down his missing medals. Actor Hugh Grant has pledged a £1,000 reward for their safe return. 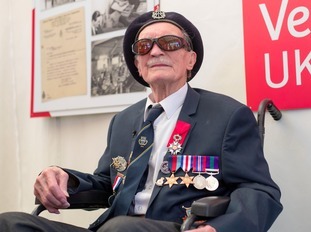 A blind D-Day veteran is set to receive some replacement medals after his original ones went missing at a motorway service station. A medal collector has gifted a war veteran the best birthday present, after an appeal to find his missing war medals hit the headlines.